"When I was eighteen, I discovered the truth about the world. Nothing's what you thought it was. No one's who you thought they were. And some people have a dark side. Really dark. I also discovered that, what ever your destiny is, it will find you. And when it does, be ready." Clary offers teens everywhere this bit of encouraging insight in the first trailer for Shadowhunters. An adaptation of the The Mortal Instruments, the action-packed fantasy series is coming to ABC Family in 2016. The first Shadowhunters trailer arrives following two teasers from earlier in the month. This sneak peek, based on the popular Young Adult fantasy novel series by Cassandra Clare, was launched on the show's snapchat account. In it, we are introduced to the main characters through a quick sequence of clips. Here, we get our first glimpse at the lead character Clary played by Katherine McNamara, who starred in this past September's The Maze Runner: The Scorch Trials. 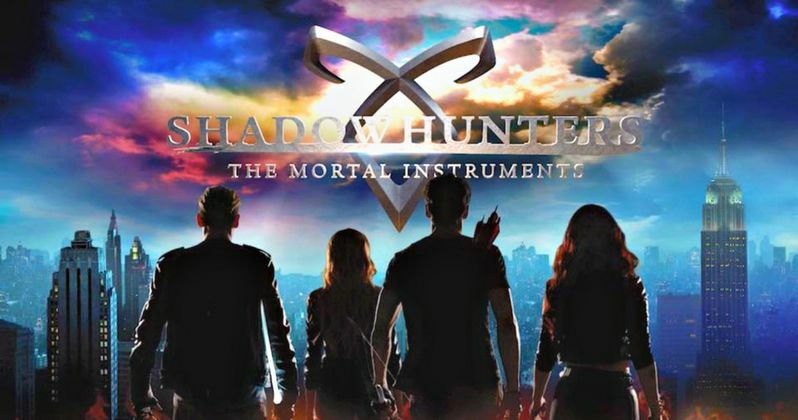 Joining Katherine McNamara on the small screen are Dominic Sherwood as Jace, Matthew Daddario as Alec, Emeraude Toubia as his little sister Isabelle, Alberto Rosende as Clary's best friend Simon and Isaiah Mustafa as Luke Garroway. Shadowhunters marks fan-favorite Harry Shum Jr.'s first role since Glee came to an end this spring. Also appearing on the show are Alan Van Sprang, Curtis Morgan and David Castro. McG, known for such hits as Charlie's Angels and Terminator Salvation, directed the pilot episode. The story follows 18-year-old Clary Fray, who discovers on her birthday that she is not who she thinks she is. She is ascended from a long line of Shadowhunters, human-angel hybrids who hunt down demons. When her mother Jocelyn is kidnapped, Clary enters into the world of demon hunting alongside mysterious Shadowhunter Jace and her best friend Simon. Clary must now live amongst faeries, warlocks, vampires and werewolves. She soon begins a journey of self-discovery, learning more about her past and what her future may hold. Before becoming a TV series, Cassandra Clare's novel series was attempted as a movie franchise with The Mortal Instruments: City of Bones arriving in 2013. It starred Lily Collins as Clary Fray, with a cast that also included Aidan Turner, Lena Headey, Jonathan Rhys Meyers and Jared Harris. The film failed to recoup it's budget. The Mortal Instruments: City of Ashes was originally supposed to start shooting in 2013, with most of the cast returning, but Screen Gems put the movie side of things on indefinite hold. With the TV series coming in just a few months, it's unlikely that another movie will ever see the light of day. Shadowhunters doesn't have a premiere date set at this time. But as reported earlier this week, it will arrive after ABC Family has officially changed its name to Freeform. Starting in January, the Disney-owned channel is getting a facelift to better appeal to those between the ages of 14 and 34. The programming will essentially stay the same, with Shadowhunters leading the charge in the midst of this rebranding. While we all await the return of Clary Fray, check out the first trailer right now. We also have a Marvel-ized poster for the show which just arrived from NYCC 2015.